Following (or not) the guidelines for use of imaging in management of prostate cancer. Over diagnosis and over treatment is a trend of the last two decades. It leads to increase in health-care costs and human-misery. The following headline on Medscape; Swedes Show That We Can Improve Imaging in Prostate Cancer elicited my curiosity. I was expecting “good news” – well, not this time! In spite the “general language” the study that the above mentioned headline refers to is not addressing the global use of imaging in prostate cancer patients’ pathway but is specific to use of radionuclide bone-scans as part of patients’ staging. The “bad-news” are that realization that the Swedish government had to invest many man-years to achieve “success” in reducing unnecessary use of such imaging in low risk patients. Moreover, the paper reveals under-use of such imaging technology for staging high risk prostate cancer patients. Based on this paper, one could come to the conclusion that in reality, we are facing long lasting non-conformity with established guidelines related to the use of “full-body” imaging as part of the prostate cancer patients’ pathway in Europe and USA. Prostate Cancer Imaging Trends After a Nationwide Effort to Discourage Inappropriate Prostate Cancer Imaging, Danil V. Makarov, Stacy Loeb, David Ulmert, Linda Drevin, Mats Lambe and Pär Stattin Correspondence to: Pär Stattin, MD, PhD, Department of Surgery and Perioperative Sciences, Urology and Andrology, Umeå University, SE- 901 87 Umeå, Sweden (e-mail:par.stattin@urologi.umu.se). Reducing inappropriate use of imaging to stage incident prostate cancer is a challenging problem highlighted recently as a Physician Quality Reporting System quality measure and by the American Society of Clinical Oncology and the American Urological Association in the Choosing Wisely campaign. Since 2000, the National Prostate Cancer Register (NPCR) of Sweden has led an effort to decrease national rates of inappropriate prostate cancer imaging by disseminating utilization data along with the latest imaging guidelines to urologists in Sweden. Results Thirty-six percent of men underwent imaging within 6 months of prostate cancer diagnosis. 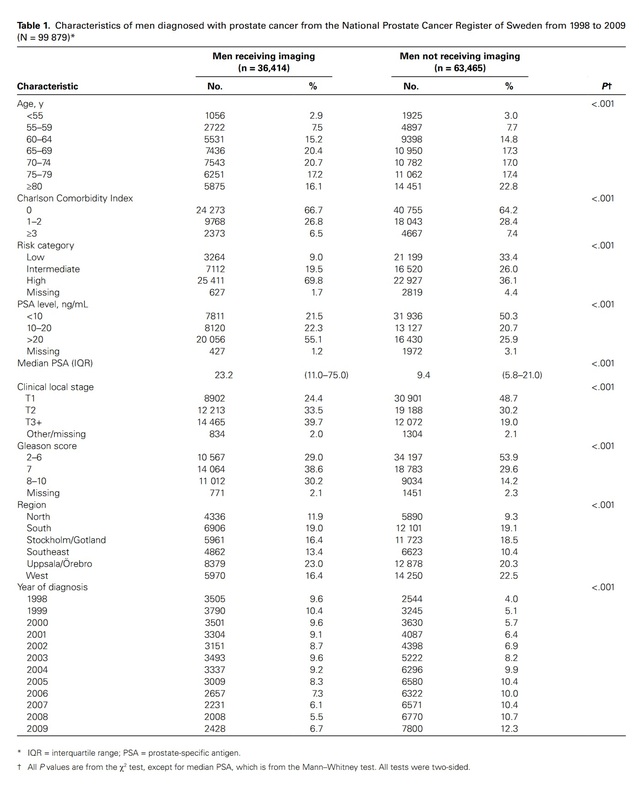 Overall, imaging use decreased over time, particularly in the low-risk category, among whom the imaging rate decreased from 45% to 3% (P < .001), but also in the high-risk category, among whom the rate decreased from 63% to 47% (P < .001). 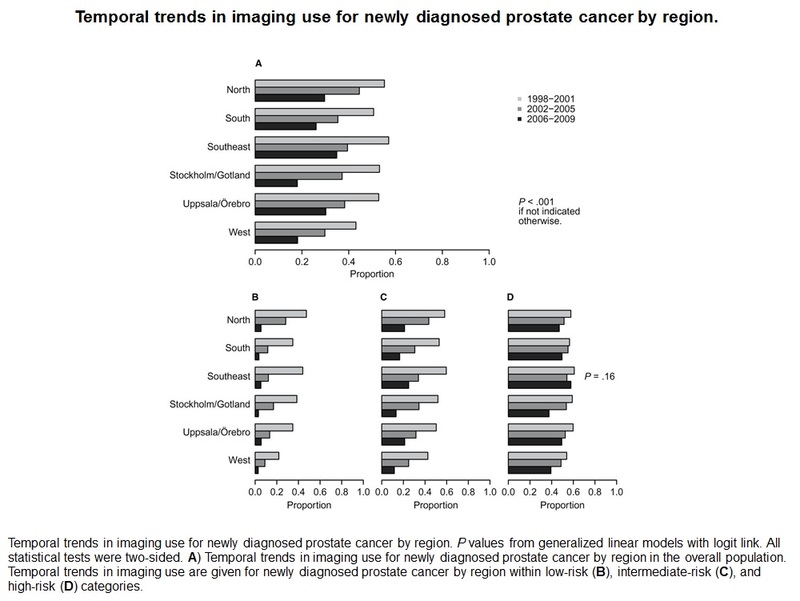 Despite substantial regional variation, all regions experienced clinically and statistically (P < .001) significant decreases in prostate cancer imaging. These results may inform current efforts to promote guideline-concordant imaging in the United States and internationally. In 1998, the baseline low-risk prostate cancer imaging rate in Sweden was 45%. Per the NCCN guidelines (7), none of these men should have received bone imaging unless they presented with symptoms suggestive of bone pain (8,24). In the United States, the imaging rate among men with low-risk prostate cancer has been reported to be 19% to 74% in a community cohort and 10% to 48% in a Surveillance Epidemiology and End Results (SEER)–Medicare cohort (10–13,16). It is challenging to compare these rates directly across the two countries because the NPCR aggregates all staging imaging into one variable. However, our sampling revealed that 88% of those undergoing imaging had at least a bone scan, whereas only 11% had any CTs and 10% had any MRI. This suggests that baseline rates of bone scan among low-risk men in Sweden were similar to those among their low-risk counterparts in the United States, whereas rates of axial imaging were likely much lower. During the study period, rates of prostate cancer imaging among low-risk men in Sweden decreased to 3%, substantially lower than those reported in the United States at any time. Miller et al. describe a decline in imaging associated with a small-scale intervention administered in three urology practices located in the United States participating in a quality-improvement consortium. Our study’s contribution is to demonstrate that a similar strategy can be applied effectively at a national scale with an associated decline in inappropriate imaging rates, a finding of great interest for policy makers in the United States seeking to improve health-care quality. 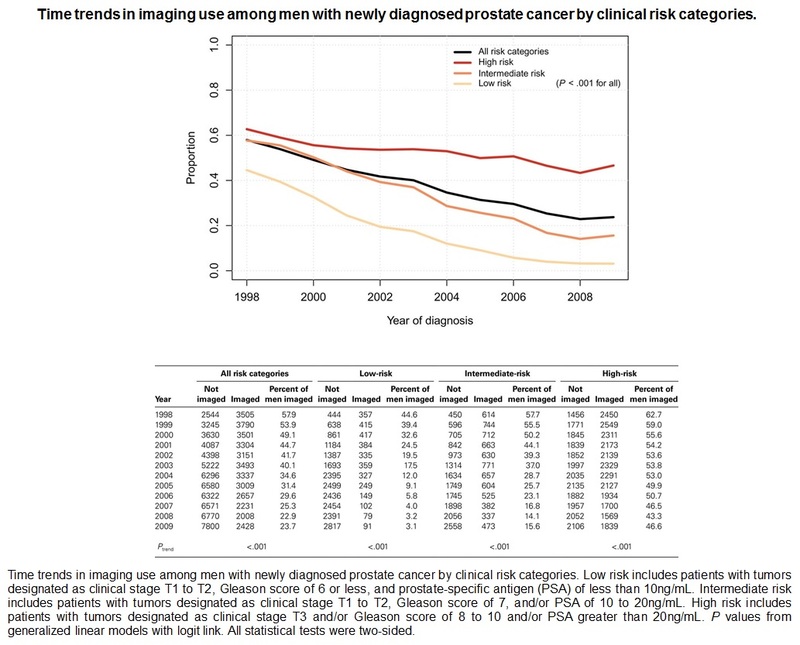 In 1998, the baseline high-risk prostate cancer imaging rates in Sweden were 63%, and decreased by 43% in 2008 (rising slightly to 47% in 2009). Based on our risk category definitions and the guidelines advocated in Sweden, all of these men should have undergone an imaging evaluation (8,24). Swedish rates of prostate cancer imaging among men with high-risk disease are considerably lower than those reported from the SEER–Medicare cohort, where 70% to 75% underwent bone scan and 57% to 58% underwent CT (13,16). These already low rates of imaging among men with high-risk prostate cancer only decreased further during the NPCR’s effort to promote guideline-concordant imaging. Clearly in both countries, imaging for high-risk prostate cancer remains underused despite the general overuse of imaging and numerous guidelines encouraging its appropriate use (3–9).